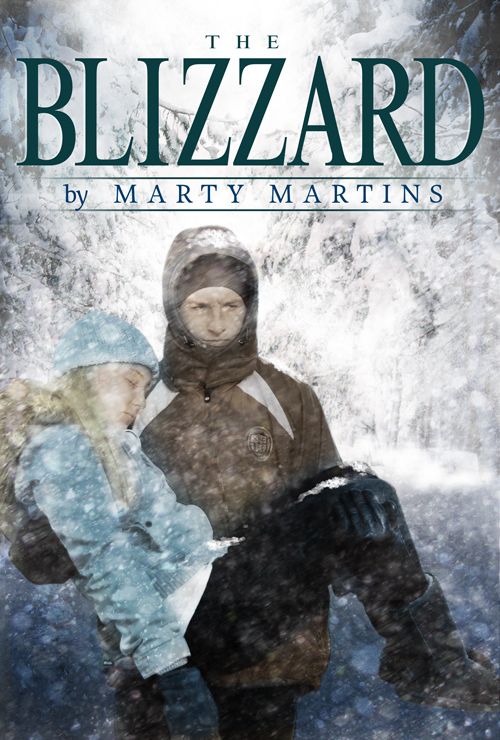 At some point as I was writing or editing The Blizzard, I began imagining what the cover should look like. Illustrations of that creative process follow below and were pretty firm by the time I contracted with Createspace to print my book. Createspace offers four types of cover formatting, all of which include an author’s photo and a bar code). The quartet of options range in price from $299 (you pick from one of their many “pre-fab”cover formats, one of 30 cover background colors, two choices of type fonts, and provide a cover illustration) up to $1,499 for a cover that includes a custon illustration and up to ten hours of design time and extensive input from a professional designer. I opted for Column B, the Author’s Advantage. It comes with a single image selected by a professional book designer and up to five hours of design time from a professional graphic designer. Well, I already had the image of my choice and Frank Fung had already designed by cover, so Createspace cut me some slack on the price. I still needed them for the back cover design, the spine, and the bar code. Final remarks on the Createspace work are in the closing paragraph down below, but first, here’s how my front cover came to reality. I had been discussing my ideas about a cover with my friend Pete Lampkins. 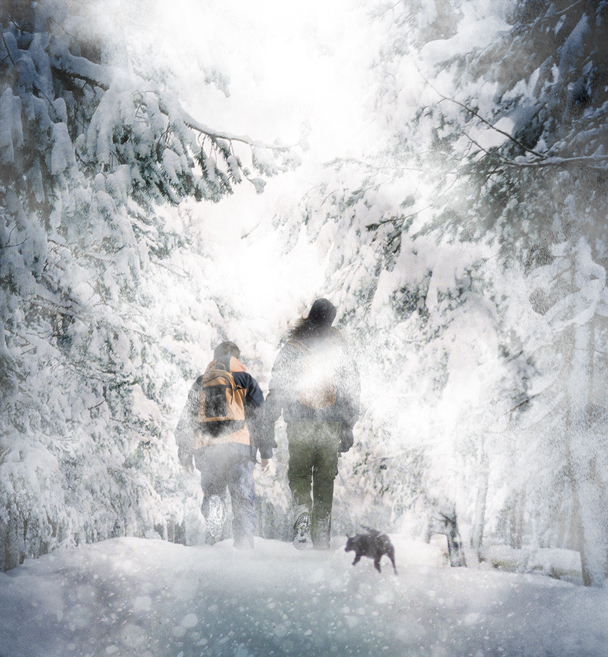 I don’t think I said much more than wanting a boy and girl in the woods with his dog during a snowstorm. A few days later he emailed me this image. Needless to say, I was impressed how close he was to being on the right track. Of course, Belle, the German Shorthar Pointer, looks like a Chihuahua or a big rat, the couple are hiking together rather than the boy carrying the girl, and they are walking into the woods. I wanted them walking “out” of the storm so buyers could see their faces. Coincidentally, and contemporaneously, another friend, who is a professional artist, illustrator, and cartoonist, knocked out a sketch of a cover idea. 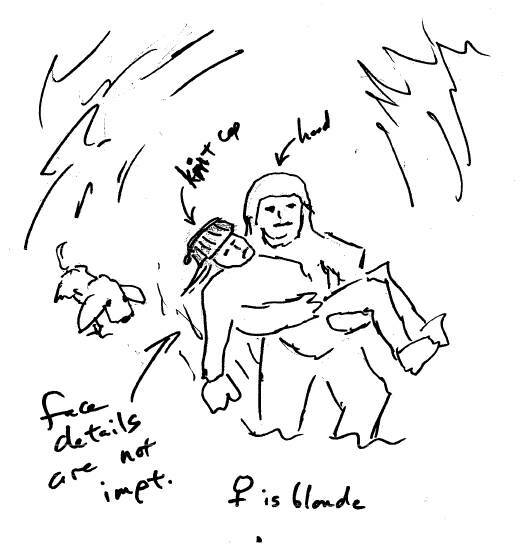 In this one, the hero was carrying the girl, but, again, they were walking into the woods. So, I (not a professional artist!) drew up this sketch. I scanned this sketch and emailed it Pete, who was collaborating with a graphic artist and designer buddy of his in New York named Frank Fung. Within days, they sent me a cover that was almost perfect. I was blown away! The only trouble was the boy did not have a hood on his coat as in the story, and girl wasn’t wearing gloves or mittens! He was out in the woods in a blizzard and she had been sledding all day! Also, it seemed as if the girl had a small smile on her face. Pete said, “No problem,” or words to that effect. Well, actually, it might have been more about how picky I was being. Nevertheless, he arranged for the two models — Christopher and Ellen, two high school students who were friends of his family — to meet him and me at Pete’s house. A modeling agency could not have picked two better subjects for the hero and heroine I imagined for the cover. A point to remember, though. Whether you are paying your models or not, BE SURE to have them sign a model’s release. It could save you big legal hassles in the future if someone wanted to get nasty. Also, in my case, both Christopher and Ellen were minors, so I had to also get their parent’s signature on the model’s relase, as well. This is the photo Pete (who is a top notch photographer) took in his backyard. Nope – it doesn’t look much like a woods or a snowstorm, does it? We didn’t care about Christopher’s sneakers as they’d be out of the picture. In the story, though, the heroine’s coat and cap are light blue and I thought Christopher’s red jacket would be too dominant on the cover. All of that was easy to fix. Frank, the Photoshop wizard, changed the colors of both coats, the cap, and her boots and mitten. He cropped out the green Southern California background and inserted a wintry northern Illinois woods. Notice, also, how he added falling snow in front of the subjects and accululated snow on top of the boy’s hood and the girl’s lap and legs. Add the title and author text and, viola, the front cover of The Blizzard was ready! I sent Frank’s cover design to Createspace. They already had the text for the back cover as mentioned in Createspace – Part 2. They offered me two options for the back cover layout. I passed on including my photo, thinking it a little presumptuous for a first time author to include a mugshot, plus I wanted the space for more important stuff. I told Createspace all I wanted on the spine was title, author, and the name and imprint of my publishing company. They did a great job of wrapping the snowy forest from the front cover around the spine and onto the back. And, as previously mentioned, they me a proof of each step for approval before moving onto the next step. In Part 2 of my Createspace report card I did not give them a grade, but for cover design (even though Pete, Frank, and I did most the heavy lifting) they still get an A+. This entry was posted in Book Cover Design, Characters, Cover Design, Literary Characters, Self-Publishing. Bookmark the permalink. Hi Marty, that’s interesting how you developed your cover. What’s the best way to link to your blog? Is it Entries RSS? dwightokita2011.blogspot.com Thanks.